Offer Terms: Deposit and spend at least £10 on bingo and receive £10 slots bonus (30x wagering required to withdraw winnings) and £20 bingo bonus (3x wagering). Bonus credited automatically and will expire after 7 days. The Sun Newspaper is one of Britain’s most popular papers, so it’s of little surprise that they decided to dip their hands into a bit of online gaming. The site started in 2006 and was inspired by the paper bingo cards that came every week with the newspaper. In 2016, Sun Bingo moved over to the Playtech bingo network which saw the arrival of newer features, a slicker site, more games and bigger jackpots. The site in general stayed the same however, so players can still enjoy the Sun Bingo theming that they know and love. On first glance you’ll be greeted with that bright pillarbox red branding, and the main focus of the site is on the community spirit and social side of bingo. You’ll find a vibrant community hub with links to chat rooms, social media and winners stories from all over the UK, and the bingo on offer is really varied and fun. You’ll find games in 75, 80 and 90-ball formats across a mixture of well known rooms like Rainbow Riches and Deal or No Deal, and also rooms exclusive to Sun Bingo players. There’s even a brand new game which arrived in September 2017, and this allows players to enjoy a special 36-ball game unique to Sun Bingo. The platform also has a huge selection of slots and side games too, including huge progressive jackpot games like Cleaopatra’s Chest and Adventure’s in Wonderland. Sun Bingo like to put its players first at all times, therefore you’ll never be short of a promotion or two. From BOGOF Bingo through to massive cash prizes, there’s always something exciting up for grabs. Players can also bag physical prizes too, so don’t be surprised to see an exotic break away or a swanky new car on the prize board one day. 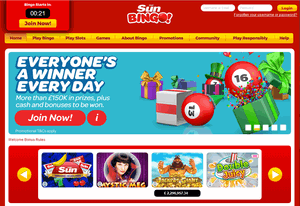 The welcome offer at Sun Bingo is fab, and is a great way to get a feel for the site and trial all the games that Sun Bingo have to offer. Details can be found via the link at the top of this page, and terms and conditions willy apply. Players must be aged 18 or over. Others offers and promotions tend to update quite regularly, so there’s always something to take your fancy. Expect deals available on a daily, weekly and monthly basis including bonuses, prize nights, and jackpot draws. This is in addition to a ton of free bingo and a new leaner bingo room where you can get your head around online bingo without risking your own cash. Sun Bingo also offer loads of bonuses over on social media sites such as Facebook and Twitter. Play certain games or features for extra bonuses and daily treats. You will also find plenty of chat room games too including the Monday Night Quiz. Play along for cash prizes and bonuses, whilst having some banter with friends and meeting new Sun Bingo Roomies. 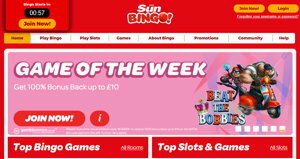 Overall Sun Bingo has to be one of, if not the best, bingo website for existing customer offers right now. Sun Bingo is registered to News Group Newspapers Ltd, and licensed and regulated in Alderney. The platform operates on the Playtech bingo software. The Bingo on offer at Sun Bingo is nice and varied, and there’s always something for everyone to enjoy. There are 20 rooms altogether offering games in 36, 75, 80 and 90-ball formats. The site offers popular rooms such as Deal or No Deal, Rainbow Riches, Cash Cubes and Bouncy Balls as well as rooms exclusive to Sun Bingo Players. The Candy room hosts the highest prize money for the coolest cats. This room is open 24/7 and tickets start from 10p a game. The All Winners room offers daily and weekly specials on a variety of 90-ball games for free. The brand new Winning Headlines room arrived recently in September 2017. This offers an exciting 36-ball game that’s completely unique to Sun Bingo, and won’t be found on any other site! Other rooms include Showboat, Hearts, Glamour, Romance, Jazz and Cabaret. These all offer exclusively themed Sun Bingo games with huge jackpots and loads of social fun. There is a great variety of slots and side games on offer at Sun Bingo too. 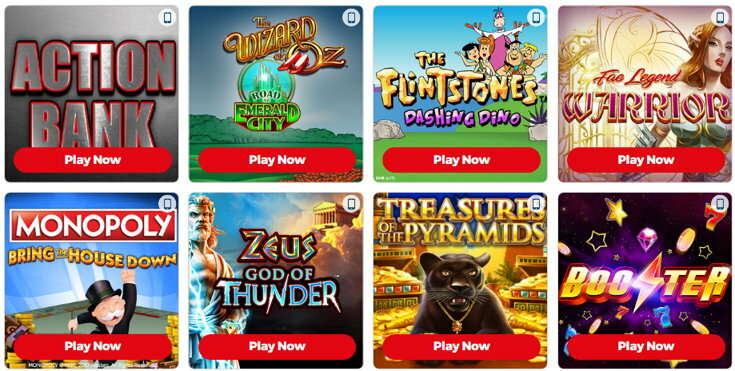 Top titles include Stampede, Cleopatra, The Wizard Of Oz and Zeus God of Thunder, as well as new and exclusive games such as Rainbow Magic and WIns of Fortune. There are also over 20 progressive jackpot games too, with prizes of up to a million quid. You will also find a nice selection of scratch cards and side games offer including Blackjack, Roulette and Perfect Blackjack. Sun Bingo also host the Mystic Meg and Winning Headlines slots games too. Mystic Meg was the resident astrologer at The Sun Newspaper for years, so Sun Bingo is the perfect place to spin the wheel of destiny for free games and extra bonuses. The Winning Headlines is a slot similar to the new Bingo game on offer. Please read all terms and wagering requirements upon registration, as details are always subject to change. Withdrawal processing times can vary. Bingo wager is 3x bingo bonus. Casino wager is 30x games bonus. Sun Bingo offers a fun, personal gaming site with fantastic games and great promotions. It is really high quality and offers both popular titles as well as more intimate, exclusive rooms. There’s even a game you won’t find anywhere else. If you’re after a site that’s bright and fun with a great social feel and a huge variety of games, then why not give Sun Bingo a whirl.